I was sitting on my deck this quiet morning sipping my coffee and listening to the birds making their usual calls. The Carolina Chickadees and the Tufted Titmice are moving about my river birch, flying through the water mister that my husband set up in the tree. A juvenile Blue jay is making its high pitched cry nearby, hummingbirds are chasing each other all around, and there are a few Cardinals and a couple species of woodpeckers either at the suet feeder or on the platform feeder down below. You can’t beat that right? Then I hear this high pitched call that tells me that there has to be a Green Heron somewhere up in the tree. So I slowly get up to see if I can locate that very secretive bird and sure enough there it is, a young Green Heron perched on a limb. Now that’s even better because I haven’t seen a Green Heron for a number of days now and I know that they won’t be around much longer. What is a Green Heron you ask? It is a type of wading bird that has an S shaped neck and a long bill and longer legs than the average bird. Adult Green Herons have a green irridescent capped head with a reddish brown neck and breast and greenish blue feathers with yellow legs. 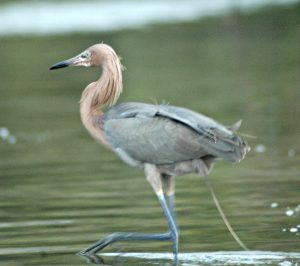 NOTE: Most herons have long legs such as the Great Blue Heron who stands at 4.5 feet tall and is in the same family of birds. However, the stocky Green Heron only measures in at about 1.5 feet tall. That’s a big difference! 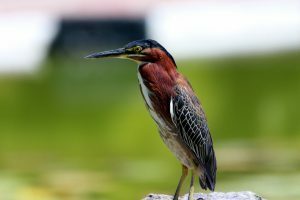 Where Are Green Herons Found? Green Herons breed in the eastern United States going as far west as North Dakota. They can also be found in Texas, New Mexico, and Arizona. Where I live in Kentucky, this little heron arrives some time in April and will stay until about September. Their winter home is in Central America and Mexico. 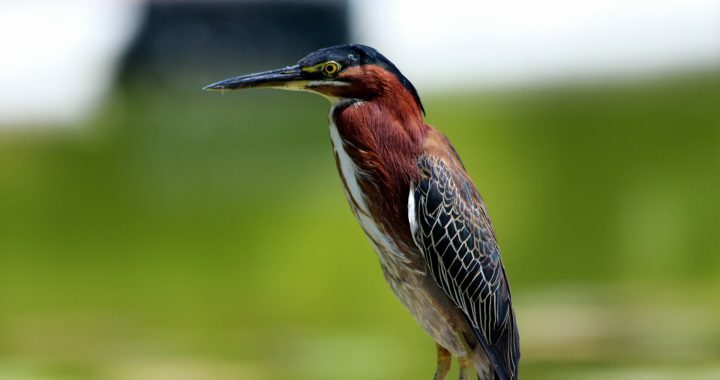 Green Herons like shallow water and can be found near ponds (that is what we have), mangroves, streams, swamps, or any wetland type area and thick vegetation. They feed mainly on small fish such as minnows, shad, but also crayfish and other crustaceans, insects, snakes, frogs, tadpoles, earthworms, and snails. Green Herons will crouch down with its head close to its body when it is fishing for food. When it sees its prey it will quickly dart its head into the water to catch it. They sometimes use lures to do their fishing. They may use feathers, twigs, or insects to drop onto the surface of the water to attract fish to it. Their nest is a platform of sticks in a large tree that is usually secluded. The male starts to build the nest at first, then the female completes it with the male’s assistance. Sometimes Green Herons will rebuild on old nests of other herons. Both the male and female incubate the eggs which takes about three weeks. Both feed and raise the young. Young Green Herons learn to fly at about twenty three days old. The male and female are similar in appearance with the female having somewhat duller coloring. Some Green Herons migrate but others that live in the coastal areas remain all year long. There are five other herons that are found in North America. A heron is a long-legged freshwater and coastal wading bird. Egrets and Bitterns are also a type of heron but I am not going to cover these birds at this time. 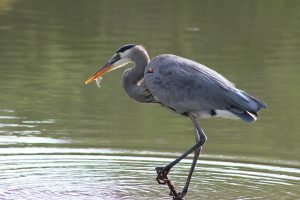 Great Blue Heron – This is the most abundant and widespread heron found throughout most of North America. It can stand up to 4.5 feet tall and can be seen throughout the year. They live in freshwater and saltwater habitats. You can usually find them along the shorelines of the ocean, lakes, ponds, rivers, and streams. We have a frequent visitor at our pond. 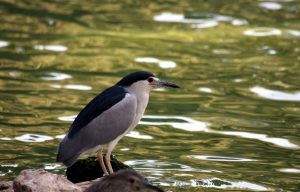 Black-crowned Night Heron – they breed throughout the United States and southern Canada and can be seen mainly at night. They can be found near shores and in marshes. 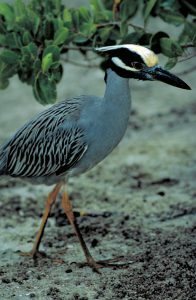 Yellow-crowned Night Heron- can be found more near the coastal waters in southern United States during breeding season. All seasons in Florida and Mexico. This heron is more secretive than the Black-crowned Heron and its habitat is in mangroves, streams, swamps, and bayous. Tricolored Heron – found mostly near coastal lowlands in Florida and the Gulf Coast. They are mostly permanent residents there. Its habitat is marshes, along shorelines, streams, freshwater marshes and lakes and rivers. 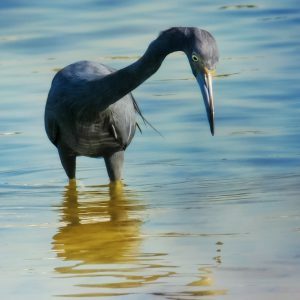 Little Blue Heron – breeds in the more southern states of the United States with some being permanent residents especially in Florida, and the more southern parts of South Carolina, Georgia, Alabama, Mississippi, and Texas into Mexico. This heron’s habitat is around ponds, shorelines, marshes, and swamps. Green Herons are a shorter, stocky heron found in the eastern half of the United States. They are pretty secretive birds as I usually do not see them all of the time around the pond in my yard. 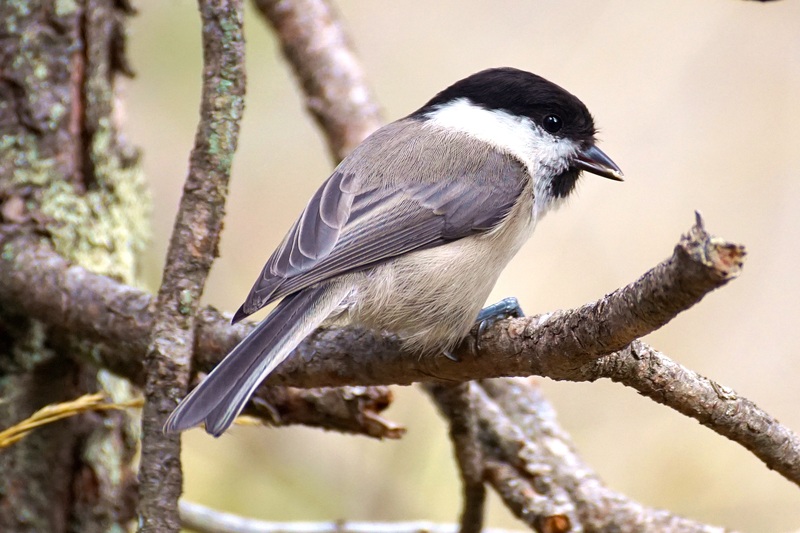 Usually the only time that I do is when I hear their loud high pitched call and that is usually from its perch up in a nearby tree or in my own river birch. Sometimes I see them hunting along our pond or wading in the shallow water as it fishes for its food. They are a beautiful greenish blue with reddish brown coloring around the neck and chest area with yellow legs. They are not quite as big as the common Great Blue Heron but they are just as neat to see. Look for them around wetlands, near ponds as in my case, near streams, and in swamp like areas. You will definitely enjoy seeing one for sure! Posted in Ducks, Geese, Shorebirds and tagged green heron, herons.